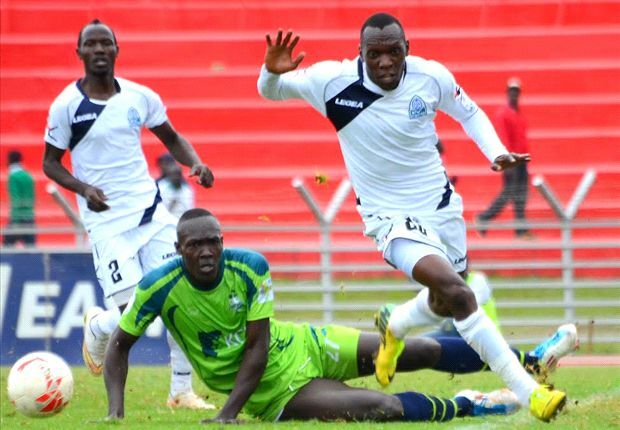 After a six month absence from the team, Rwandese talisman Meddie Kagere is back and will help spur Gor Mahia’a attack during the second leg of the 2016 Kenya Premier League. This comes as good news to Gor Mahia fans as the Kogalo attack has not been as sharp as it was in 2015. And there has been an overdependence on Jacque Tuyisenge. “We are happy to announce the signing of our former player Meddie Kagere. He has signed a two-year contract which will see him with us until 2018.” said an official to goal.com. Kagere left in December after the club could not meet his sign on bonus demands. The well traveled and highly experienced Kagere has featured for several clubs in Rwanda such as Atraco FC, Police, Rayon Sports, Kiyovu and Mukura. He has also played for Club Esperance (Tunisia) and FK Tirana (Albania). At the national level, the 29-year old talent has made 30 appearances for Rwanda national team, Amavubi, scoring 10 goals in all competitions. Meanwhile Brazilian striker Thiago Da Silva will stay at Kogalo on trial for a period of 6 months. Da Silva arrived in the country last month to much fanfare. Since then he has been the subject of rumours with reports suggesting he was already on his way back to Brazil. Da Silva had previously played in the Macau league where he scored 15 goals. And be prepared for sweet goals as Mighty Gor takes on “my tea” Thika. All the best team kubwa. It’s unfortunate that in the process of getting Kagere we have to release Aucho to go for trails since his position can complicate matters for us. isokei lakini bado kusikia triol ya 6month. Atakulaje, atsishi je. Hiyo yote pesa ya gor. Gor ni clab kubwa. Gor dhiang maduong we jo brasl bende ochode manono. Yes Gor ni gym, pia ni football catwalk na mazima ni mingi.2 sponsors mpaka hata gate collections ni siri siku hizi but isokei. All the best Aucho but something which that puzzles me is why Aucho,Teargas/”King” David (though GB his agent is just after commissions) of Zesco are leaving big clubs that are participating in CAF for small South African teams. An extra season @ GM/Zesco can land them better exposure. i think the ec made a blunder with olima, so they had to come up with a solomonic solution so they dont end up paying olima a hand and leg in contract tarmination fine.so they hav done there maths so they will feed him,bath him wit gor dhiang maduong as @okewkanango puts it. This is now proffesionalism. Kudos! Good work. what?profesonalism? kulisha tourist olima is professionalism…..mmm. ata mimi naenda chelsea for six months trials.i wil not mind so long i get food and a place to sleep mark you i dont even know how to play one touch game. geting my drift? @Dawaplus, a mistake was done and there needed to b an easier way out. remember Walusimbi, Njoroge and Mosoti were paid some good sums just because of improper contract termination. Welcome kabisa. A good but at some price. With Olima on trials for a record 6 months, si speed citizenship Na shamba kabisa huko Kabuoch ajenge boma. Halafu wuod Olima apate nyakabuoch. Awache kodhi yake hata kama mpira bado kuona tunda zake. How good is the other new signing and what position does he play?sad to see Aucho leave GM.For me he has been the best box to box midfielder in Kenya in the last 3 or so years!! Jasego relies on hearsay and other websites for information…he is definitely not a member of EC or even close.He just beats us to info coz he somehow seems to have resources to fish for info here and there.It has kind-of worked for him..though not all the time! So sad to see Aucho leave. How good is this Odula? I have just been hearing of him at Coastal Union, Finland, AFC Leopards….. WAIT A MINUTE…..Good to have him back but will he play for the next 6 months…Here is the reason why..Kagere has been signed by Kogallo with expectations that one of the foreign players will leave to create room. Has any foreigner left already ? NO, NO , NO…The Pressure for EC now is to figure out how to offload one foreigner to any league in the world whose international transfer period ends in 30th September. So nice people, let us NOT celebrate yet, this guy we have been crying for may only feature in friendly matches. Do you remember the Dirkir Glay Saga and offcourse the other one…the Ghanaian guy called Tawfiq ? The warmed the bench and played friedly matches until they were eventually loaded off. First get the difference between signing and fielding, the put foward your arguement. Otherwise I think you are wron on this one! @False 9, Aucho’s situation was tough for Gor. What if he passes his trials the we cannot get Kagere or Thigo. If he fails then he comes back and we have the issue of reliance on 1 striker. We release Siboumana unprocedurally and we get fined like 10m by FIFA . Were are talking about seasoned administrators here. Jakom, Ngala and Kilo. Same mistakes every six months. Ain’t it a case of can’t learn , won’t learn. Let us be slapped with the kshs.10million and SURCHARGE the blundering officials. The other day Situmbeko/GB disappeared with 4M. Gate collection figures are mirage nowdays. Even sponsorship was to be a secret. Wacha we babysit Olima PESA NI MINGI. WHY WOULD YOU RELEASE SIBOMANA AND RETAIN OLIMA WHO CAN’T BE FIELDED FOR SIX MONTHS. Contracts can be terminated and people paid off. JUST SURCHARGE THE OFFICIALS CONCERNED AMA THE CONTRACTS WERE SIGNED BY GHOSTS FOR GM. THIS IS THE PROBLEM OF PLACING A MORTAL ON A PEDESTAL. WITH NO FEAR OF CONTRADICTION K’GALO WOULD BE VERY FAR IF IT WERE NOT FOR OPAQUE ADMINISTRATION. OUR ACHIEVEMENT ARE WAY BELOW WERE WE SHOULD BUT BECAUSE WE WIN THE LEAGUE WE ARE BLINDED BY CLUELESS BLOATED EC. Ngala says he is still a Gor player theoretically. If he succeeds I am not sure if we will get any transfer fees. But should he fail Ngala says he will come back and keep on training with Gor till the new season. By then hopefully they shall have gotten a solution to this foreign quota quagmire. Makes some sense to me. Caveat: Only if it is all true. Of late Gor has had so much uncoordinated flow of information you never know who is saying what, truth, lie or whatever. Can’t tell how eligible this is, but hii ofisi mimi apana elewa saaana, ikitendeka ndio huwa tunaezaamini. Gate collections zmefika ngapi so far? I used to love seeing those figures…. Imagine you are the Gor CEO/Chairman and you are confronted with the issue like that of Aucho. What would you do? The club has to have long-time as well as short-time targets/solutions. You need a striker to win you games, you have the best midfielder in the region. He has a six–month balance on his contract. on the other side your best striker wants to pen a 2-year contract. Kama ni wewe ungefanya nini? And here is a chance to lose as much as 10m if the player gets transferred. Aucho is still a Gor Mahia player and should he fail in trials in Scotland, he will come back to train with the club but he can’t play in KPL log. @False 9. May be the EC were in a catch 22. They may have looked at where we are lacking the most. was it in the midfield or in striking? i think the answer to that is obvious. Also i would like to think of kogalo’s campaign as not only geared to winning the league whixh is worh only 4.5m. If you try to read the minds of the EC, you would realise that winning the league is only a bridge to the place they realy want to go to……..the CAF CL 2017. Aucho is still our player bcos his contract has not been terminated.what happens is that he is not registered to take part in the league & domestic cup organized by kpl & fkf. The fact that he is a Gor play makes Gor the beneficiary of any transfer fee that may be paid if he succeeds in trials. That is being smart by AR to avoid unnecesary problems localy & internationaly & benefit on the player. on another note why dont EC change the policy on tshirt sales by printing the names of players on all tshirts. Pod An tie: the issues being addressed can not be solved by merely conforming to the International Transfer Calender. Rachier and the EC cannot defend giving an unfit player a contract while some of those who have served us so loyally in the past are being cast away like bad rubbish with no pay at all. Look at Eric Ochieng and Awillo for example. Kagere may guarantee us goals but Aucho also brings stability and strength in the team.